Status and Trends: In 2015, the Bathurst herd estimate was 19,769 ± 7,420 (SE) caribou. This 2015 estimate is a 96% decline from peak herd size which was 472,000 in 1986. The curvilinear shape of the decline was because the initial rate of decline was slow and then accelerated between 2006 and 2009, when the herd estimates dropped from 128,000 to 32,000 caribou, equivalent to a halving time of ca. 1.7 year (Boulanger et al. 2015). Ecology: The annual ranges of the Bathurst herd are underlain by the Precambrian Shield. The calving grounds have been consistently west of Bathurst Inlet since 1996 (Gunn et al. 2012) but post-calving and summer ranges (based on the movements of satellite-collared cows) have recently contracted further north (Klaczek 2015). Fall range and winter range have shifted onto the tundra with decreasing use of the boreal forests (Dominion Diamonds 2015). Migration distances such as between calving and winter were twice as far in the 1990s as in the 2000s. Habitat trends include a higher incidence of forest fires in the 1990s as well as unusually severe summers such as 2014 when 11% of the preferred winter range was burnt; overall the cumulative loss of winter range to fires is 17% (Dominion Diamonds 2015). On the Bathurst herd summer and fall tundra ranges, mining exploration was high in the early 1990s and since 1998 five diamond mines have been operational (WRRB 2016). Predation rates are unmeasured: wolf numbers based on use of their dens have declined (Klaczek 2015) but sighting rates of both wolves and grizzly bears during calving ground surveys and wolf sightings during late winter caribou surveys have not declined (WRRB 2016). In the late 1980s, annual harvests for Tlicho people averaged 14,000 caribou but as the herd declined, harvesting declined to about 5,000 caribou by 2010 (WRRB 2016). Climate: The climate shows an increasing continental influence with warmer summers and colder drier winters. July precipitation is higher than the neighboring herds which reduces the drought index despite the warm July temperatures. However the oestrid index is high. Severe events include high drought indices in 2012 and 2014 and 2014 was also had an exceptionally severe oestrid index. Significant trends are a decrease in the number of days with freezing rain, July precipitation and the mushroom index. Increasing trends are for Rain-On-Snow and warmer temperatures in October. Monitoring: Herd size is monitored from photographic estimates of the number of breeding females on the calving grounds which is extrapolated to herd size (Boulanger et al. 2015). Between 1985 and 1995, late winter calf:cow ratios varied annually and averaged >30 calves:100 cows. Between 2001 and 2006, the ratio declined and calf survival was half of previous years. Higher ratios from 2007 to 2011 were >30 calves:100 cows partly because adult female survival was low (Boulanger et al. 2011). In 2012, 2014 and 2015, possibly related to drought conditions, calf:cow ratios were <30. Pregnancy rates were annually variable and were also lower than average following summer droughts in 2012 and 2014 (WRRB 2016). Trends in adult survival based on modelling declined from 86% in 1985 to 76% in 2006 and 77-78% for 2009, 2012, 2015 (Boulanger et al. 2011, GNWT 2016). Harvest was monitored through community interviews 1987-93 and after 2006, changed to monitoring at check stations on the winter roads. Management: The mechanisms for the decline appear to be a natural cycle accelerated by high adult mortality from harvesting and predation as the decline progressed. Toward the later stages of the decline in 2012 and 2014, unusually severe summer droughts reduced calf and adult survival. Evidence for natural cycles of 40-60 years duration is from Aboriginal elders oral history correlated with the frequency of hoof scars on exposed spruce tree roots (Zalatan et al. 2006). 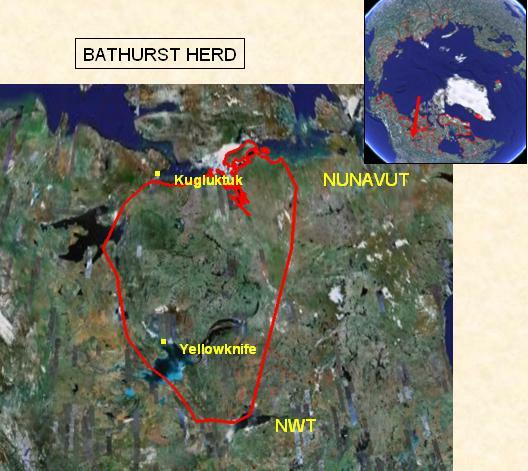 The herd’s annual range is within the jurisdiction of the Governments of Nunavut and Northwest Territories and three co-management boards. The Wek’èezhìı Renewable Resources Board, Sahtu Renewable Resources Board, and Nunavut Wildlife Management Board have held public hearings to develop management actions. Although the decline was recognized in 2003, sequential restrictions did not start until 2007 with reduced commercial harvesting. In 2010, all commercial and resident harvesting was halted and subsistence harvesting was restricted to 300 caribou. As the herd decline accelerated, subsistence harvests were halted in 2016 (WRRB 2016). In 2010, attention also focused on wolf management and incentives for wolf harvesting were increased but did not appear effective (WRRB 2016). Boulanger, J., A. Gunn, J. Adamczewski, and B. Croft. 2011. A data-driven demographic model to explore the decline of Bathurst caribou herd. Journal of Wildlife Management 75:883-896. Boulanger, J., B. Croft, J. Adamczewski, D. Cluff, M. Campbell, D. Lee and N. Larter. 2015. An estimate of breeding females and analyses of demographics for the Bathurst herd of barren-ground caribou: 2015 calving ground photographic survey. Environment and Natural Resources, Government of Northwest Territories. Unpublished Report available at WRRB Public Registry. Gunn, A., K.G. Poole, and J.S. Nishi. 2012. A conceptual model for migratory tundra caribou to explain and predict why shifts in spatial fidelity of breeding cows to their calving grounds are infrequent. Rangifer Special Issue No. 20:259–267. Klaczek, M. R. 2015. Denning ecology of barren-ground wolves in the central Canadian Arctic. M.Sc. Thesis. University of Northern British Columbia, Prince George, British Columbia. 116 pp. Zalatan, R., A. Gunn, and G.H.R. Henry. 2006. Long-term abundance patterns of barren-ground caribou using trampling scars on roots of Picea mariana in the Northwest Territories, Canada. Arctic, Antarctic, and Alpine Research 38:624-630.